A holiday house I recently stayed in had a Mobile Shower Chair for use in the wet-room. The mobile shower chair has castors and brakes. Put me in a shower with a slippery wet floor, nothing to hold on to and I will take a tumble. I have difficulty standing upright on my feet and a frightening tendency to fall over Much safer to use this mobile shower chair for a shower? The arms of the chair definitely helped to make me feel very secure. The moulded seat is comfortable and provides good support for the back. Obviously the steering handle is essential for moving the chair whether or not someone is sitting in it. 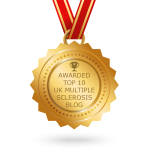 The wheels and brakes for each wheel makes the chair easy to move and it can be locked stationary for safety. There is a chair with only two brakes but I think the extra two brakes make it safer. Well it was a choice of using the showering chair or not having a shower. OK it is designed as a shower chair for the elderly but it was not uncomfortable so there was nothing to complain about. Would I recommend the mobile shower chair? Yes I would. It makes me feel safe and secure in a wet wet-room. No chance of slipping out or falling over. Definitely give it the five stars. 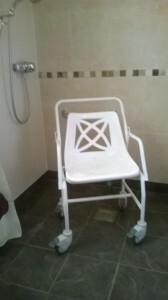 Click Aidapt Hythe Mobile Shower Chair with Castors and 4 Brakes to buy it on Amazon. The shower is over the bath so a shower chair on wheels would be no good. Instead I used to use a shower stool and a non slip bath mat in the bath. Before I bought the stool I used grip handles to stop me falling over. Click Aidapt Hythe Mobile Shower Chair with Castors and 4 Brakes to buy it. 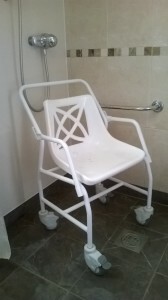 Something simple as a shower chair can give an elderly person their independence and dignity back.